A Hell of a Girl: Iron Man was AWESOME! Seriously, I LOVED Iron Man. It wasn't perfect, but it was damn close for a good enjoyable summer comic book movie. 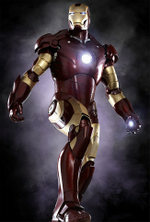 Robert Downey Jr. was fantastic as Tony Stark, Good acting all around really. Even Jeff Bridges as the power hungry over the top baddie worked. Gwyneth Paltrow was great as Pepper Potts, the uber Girl Friday that keeps Stark together 9/10s of the time. Nice too to see a mutual attraction that wasn't the insipid Moneypenny-like boss worship. Justin and I went to the Metreon Friday night (beautiful walk past Union Square) and got in line at 8 PM for the 10 PM showing. No. Sold out while we were in line. Once we got to the head of the line the only showing was 11 PM. But it's the weekend and we can stay out so we decided to take it. Justin got me a coffee st Starbucks since I would be dragging otherwise. We went up and saw the 10 PM showing line. I have not seen a line like that since the midnight opening of Lord of the Rings. When they finally allowed the 10 PM show folks in, Justin and I joined the rapidly growing 11 PM line. We sat and talked to a really nice couple that were friendly and comic books fans, so it was pleasant to chat about fun topics with total strangers. With the conversation and the coffee, the wait was nice. Plus the Metreon has this huge wall that is glass, so the backdrop for out wait was a beautiful city-at-night skyline. I was just amazed that so many showings had sold out so quickly. I heard that movie attendence was down (speculated) because of the release of Grand Theft Auto IV. If so, I am glad, since I would have hated to have even larger crowds! So we got great seats and got to watch a well paced, funny in the right spots movie I really REALLY enjoyed. Hint: STAY THROUGH THE END OF THE CREDITS!